Shepsog is the Algonquin word for “sheep”, which once covered Vermont’s hillsides during the booming wool industry of the 19th century. The forest has since reclaimed the hills, but Grafton still sources top quality sheep and cow milk to make this mixed-milk, cave-aged beauty. Made from raw sheep and cow’s milk and aged for 4-6 months, Shepsog has a dusty gray and white mottled rind, with a firm texture that echoes the curd structure of the cheese. Expect aromas of cultured butter and fresh buttermilk, alongside bright flavors that are lemony and sweet, with notes of caramel and a clean, nutty finish. Shepsog is best served as a table cheese. Pair with toasted nuts and raw honey, shave over grilled asparagus, or enjoy with a handful of trail mix as you observe the view from your nearest mountaintop. Hemingway’s Restaurant held the AAA Four-Diamond Award for over twenty years. Chef Ted Fondulas graciously shared this recipe with Grafton from his former restaurant, which focused on Vermont foods. 1.Preheat oven to 375 degrees. Lightly butter 8, 4-5 oz. ovenproof ramekins, and set aside. 2. Boil milk in a medium saucepan over medium-high heat. Remove from heat and set aside. 3. In a medium skillet, melt butter over medium-low heat. Add flour and cook for 5 minutes, whisking constantly. Increase heat to medium. Slowly, whisk in the milk and bring to a boil for 1 minute, whisking often. Remove pan from heat. 4. Add salt and cheese. Mix until cheese has melted and is smooth. Set aside to cool. 5. Lightly whisk in yolks. 6. Meanwhile sprinkle the insides of the prepared ramekins with almonds and fennel seeds, rotating dishes to coat. 8. Bake for 50-60 minutes or until souffles begin to puff, turn golden brown on top and softly set in the middle. Note: Serve immediately or store covered in the refrigerator for a few days. Before serving, use a knife to un-mold and bake on a baking pan in a 300 degree oven for 10-12 minutes. Serve immediately. * For water bath: Place ramekins in a large shallow metal baking pan. Add enough warm water to come halfway up the sides of ramekins and gently place in the oven. To serve, plate with a salad of baby lettuce tossed in garlic oil and salt and pepper. Garnish salad with a few spears of endive drizzled with honey balsamic vinaigrette. 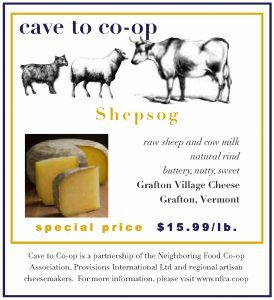 CAVE TO CO-OP IS A PARTNERSHIP BETWEEN PROVISIONS INTERNATIONAL AND THE NEIGHBORING FOOD CO-OP ASSOCIATION (NFCA) TO SUPPORT LOCAL, ARTISANAL CHEESE PRODUCERS IN OUR REGION AND MAKE THEIR PRODUCTS MORE EASILY AVAILABLE TO CO-OP SHOPPERS. THE NFCA IS A NETWORK OF MORE THAN 30 FOOD CO-OPS IN NEW ENGLAND, LOCALLY OWNED BY MORE THAN 130,000 PEOPLE LIKE YOU. FOR MORE INFORMATION, PLEASE VISIT WWW.NFCA.COOP.